Description: A close up on NS 1700 in her new NS paint trailing on 19G. Description: NS 19G running late as it passes through CP Easton with an SD45-2 and an SW1001 trailing. Description: Rolling by the railfan park at 8:32 AM. Title: Dimensional Load On Head End of 18G @ 1123 hrs. Description: Several NS engines with the focus here on SD45-2 1700. Title: SD45-2's lead CA-11/PA-10 north. Description: NS 1700 and CSX 8974 are the power set for CSAO CA-11/PA-10. Both have been repainted into the newest scheme by their owners. Description: CSAO train CA-11/PA-10 waiting for re-crew at Paulsboro Yard. Title: Re-crew for CSAO train CA-11/PA-10. Description: Crew members board NS 1700 to run north to Camden, NJ. Paulsboro Yard power quietly idles next to the mainline. 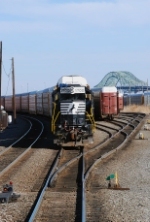 Title: Overview of power at Paulsboro Yard. Description: NS 1700 has a new crew getting on board to run it's train north out of Paulsboro Yard. Yard power sits patiently for CA-11/PA-10 to leave the main before they can continue work shifting tankers to the Valero refinery. CSAO 001 is one of the very few shoving platforms with CSAO reporting marks. Description: NS 1700 leading CA-11 north past the RICK marker. Description: 19G heads toward the Delaware River behind four units that includes SD45-2 #1700. Description: This is something that happens once in a blue moon. An NS SD45-2 and an ex-CR GP15-1 leading a long distance freight with a pair of dash 9s trailing as they descend the grade on track one. Description: Return to Jersey! Yup. Plus, were at Phillipsburg-a new spot! Our first train led by a pair of blackies-and an ex-EL SD45-2! Description: 2:26PM. 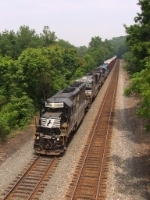 The fifth unit is an SD45-2. Description: Behind the VFW, 0726 hours. Description: The best picture(NOT TRAIN!!!!) of the day was this, a 19G extra with two ex-CR SD40-2's bracketting a classic-an SD45-2! Description: Westbound 19G extra features all EMD standard cab power. Description: An ex-Erie Lackawanna SD45-2 works the Garden Yard. Description: Holding at Richards to get 20G by. Description: One of the six SD45-2s on the NS roster brings 19G through Glendon at 12:53PM. Description: A wider view of 19G from the bridge at Glendon. A small hole in the clouds arrived at the perfect time here. Description: Main Street, 0923 hours.